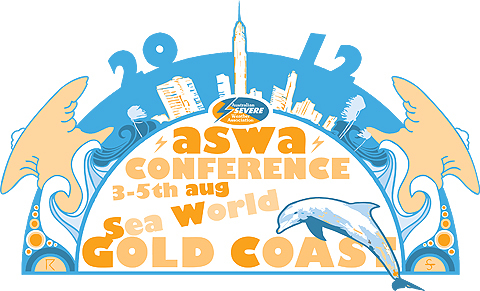 The annual conference held by ASWA each year is the event that all severe weather enthusiasts from across the country look forward to. Each year the bar gets raised with respect to the quality and fun factor, and 2012 is no exception. With thanks to our very own Margaret Shannon, we were able to secure some of the best venues the Conference has ever seen. From the amazingly awesome Cinema Experience at Event Cinemas Robina to the world class SeaWorld Resort, attendees were kept entertained from beginning to end. The weekend kicked off with some fun social Ten Pin Bowling at AMF Bowling Centres located next door to Event Cinemas. Attendees enjoyed free soft drinks, food and the social aspect that Ten Pin Bowling provides. Much fun was had by all those that attended and the bar has now been raised for pre-video night events. For the next 4 hours, we enjoyed some amazing storm footage from all over the country including the infamous 'Storm Wars' Mini-Movie made by the boys from South East Queensland in collaboration with MartyPhotography.com. The Saturday kicked off at the early hour of 7:45am with a complimentary tour of Shark Bay in the Sea World Theme Park. Guests were given a guided tour of Shark Bay by one of Sea World's excellent tour guides. Dean Narramore – A day in the life of a Bureau Meteorologist; Insight into the BoM’s 1 year training program. Clyve Herbert takes us on a weather chase through Australia and the USA. A pictorial and video presentation offering all kinds of weather with an emphasis towards Severe Weather. Michael Scollay - Warming in Antarctica - Conflicting Evidence? Attendees were glued to their seats as our presenters took them on a journey through the atmosphere. Dinner was served at 6.30pm and included a BBQ Buffet which was enjoyed by all. Sunday was a social gathering day, with a BBQ lunch provided.